One of the buzzwords entrepreneurs and employees often hear is “83(b).” So what is it and why is it important? 83(b) refers to a section of the U.S. tax code that allows you to change the tax treatment for restricted stock (or units in an LLC), i.e., an equity grant that is subject to vesting (or risk of forfeiture). Essentially, you get to accelerate the calculation and payment of income tax for the entire amount of an equity grant that will eventually vest, and this calculation and payment is at the equity’s value as of the date you purchase it, rather than at its values when it vests over time (typically at higher values). If you choose to make the 83(b) election, it must be filed within 30 calendar days of acquiring the restricted stock. It is important to note that an 83(b) election isn’t for everyone. It only applies to those who receive restricted stock in connection with services they perform for the company, i.e., founders, employees, or contractors. It also has its risks; you may determine that these risks outweigh the benefits of the election (more on this later). Date you purchase the 3,200 shares (i.e., early exercise your options) The purchase date is used to determine the value attributed to your equity award (i.e., the fair market value of the stock minus the exercise price) that gets added to your income for that tax year. Because the fair market value is equal to the price paid for the shares, the value attributed to the 3,200 shares for income tax purposes is $0. You pay no tax in connection with your purchase of the shares. You are not considered to own the shares for tax purposes until they have vested, so there is no income to be attributed to them. You pay no tax in connection with your exercise of the option to purchase 3,200 shares. 1 year cliff (25% or 800 shares of the grant vests). Fair market value of each share is now $0.80 No tax impact as the income treatment for all 3,200 shares you received was dealt with on the date you purchased the shares. The vesting triggers the determination of the value that is attributed to these 800 shares, which gets added to your income for the year. The difference between the current fair market value and the price paid (i.e., the exercise price), is $0.79. So $632 (800 x .79) is added to your income and you pay your income tax rate (say 33%) on this amount. Each quarter after the 1 year cliff No tax impact as the income treatment for all 3,200 shares you received was dealt with on the date you purchased the shares. At each quarter, 200 shares will vest and then the income attributed to you for each quarter will be equal to the difference between the fair market value at the time of vesting (which could keep increasing with each subsequent quarter and become substantial years after the initial grant) and your purchase price of $0.01. This difference will be added to your income, and you pay your income tax rate (say 33%) on this amount. 4.5 years after your purchase of the shares, the company is sold and you sell the 3,200 shares for $10 per share When you sell the 3,200 shares, you will pay capital gains tax (which, currently, is a lower rate than the income tax rate) on $9.99 per share ($10 minus $0.01). The determination of whether the short-term (higher) or the long-term (lower) capital gains tax rate will apply depends on whether you owned the 3,200 shares for at least 1 year. Because you made the 83(b) election the 1 year clock began to run the day you purchased the 3,200 shares, regardless of when they eventually vested. As such, only the long-term capital gains tax rate applies. When you sell the 3,200 shares, you will pay capital gains tax (which, currently, is a lower rate than the income tax rate) on the difference between $10 and the fair market value at the time that each share vested (so for the 800 shares that vested at the 1 year cliff, you would pay capital gains tax on $10 minus $0.80 or $9.20). Because you didn’t make the 83(b) election the 1 year clock to determine whether the long-term capital gain tax rate applies began to run from each vesting date. The higher short-term capital tax rate will therefore apply to 2 quarters worth of vesting or 400 shares because these shares have not been vested for at least 1 year by the sale. 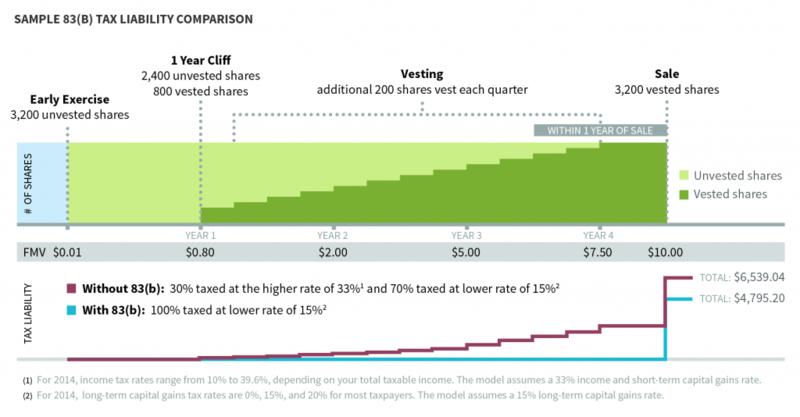 The chart below illustrates the difference in estimated tax liability based on the scenario above. Now that you understand the value in making the 83(b) election, how is it done? You must file the election with the IRS office where you file your annual return within 30 calendar days of the purchase date. This is a hard deadline and there are no exceptions. If the 30th day is a Saturday, Sunday, or federal holiday, the deadline becomes the next business day. Your election is considered filed when it is officially postmarked, not when it is received by the IRS. To be absolutely sure that the IRS received your election, you should send it by certified mail and include a self-addressed stamped envelope with an extra copy of your election, which the IRS will stamp and return to you. The required content of the 83(b) election form is relatively straightforward. A sample can be found in the related IRS Bulletin. You should consult with the company and your tax advisor when determining the fair market value of the shares at the time of your purchase, which is a value that needs to be included on the election. You must provide a copy of your 83(b) election to the company that gave you the restricted stock. Just as it is important to understand why you’d want to make an 83(b) election, it is important to understand the risks that go with it. With the acceleration of the payment of income tax to the purchase date, there is a risk that you pay income tax on the shares (i.e., because the fair market value was higher than the purchase price when you bought the shares), but you lose some of the shares if you leave the company before they vest. In this instance, you paid income tax on shares that aren’t yours anymore and you can’t recover any of this tax back (although you may be able to claim a capital loss if the payment you get in connection with the forfeiture is less than what you paid for the shares). A similar outcome would result if the company goes bankrupt and the shares become worthless—you had accelerated the payment of income tax on all the shares and can’t get any of that tax back. Another risk is that the fair market value of the shares actually falls between the purchase date and the vesting date so that if you ended up paying any income tax as of the purchase date, you actually paid more than you would have been obligated to pay if you hadn’t made the 83(b) election. Making an 83(b) election can offer you significant tax advantages, assuming the equity you’ve been granted continues to appreciate. It is best suited for restricted stock with a very low valuation or where the purchase price is equal to the fair market value at the time of purchase. *PLEASE NOTE: Shoobx is not providing tax or legal advice in the foregoing, but merely attempting to explain the applicability of the 83(b) election in certain circumstances and, to the extent you decide to make the election in consultation with counsel, how the election is made mechanically. There are many factors involved in determining whether to make an 83(b) election, but personal tax matters are complex and if you aren’t sure whether you should make the election under your particular circumstances, you should consult with your legal and/or tax advisor. For more information on Section 83(b), please see the related IRS Bulletin which describes the election and illustrates the tax results that may occur depending on whether an election is made.